Al Khobar-based the National Pipe Company Limited (NPC) has emerged as a leading manufacturer of large diameter line pipe of various specifications in the Middle East. The formation of NPC was envisioned by Saudi investors together with the Sumitomo Group of Japan as a company, which supplies quality pipes to oil, gas and water sectors, at a time of rapid industrialisation in the kingdom. NPC was the first firm in the GCC that was licensed to produce API 5L carbon steel pipes and also certified for ISO 9001 2008, says a company spokesman. The first plant with a capacity of 180,000 metric tonnes per year started its commercial production in August 1980. It was designed to produce helical seam submerged arc welded (SAW) large diameter pipes with outside diameters ranging from 20 to 60 inches (508-1524 mm) with pipe wall thickness of 0.250 to 0.875 inches (6.4 - 22.2 mm) and API 5L. In 2007 the plant was upgraded to produce pipes with larger diameters up to 84 inches (2134 mm) for a rated capacity of 250,000 metric tonnes per year. In August 2015, the mill expansion has been completed which includes a two-step welding procedure that enhances welding speed and quality. It also raised the production capacity to around 300,000 metric tonnes per year. This expanded mill started commercial production in September 2015, he says. 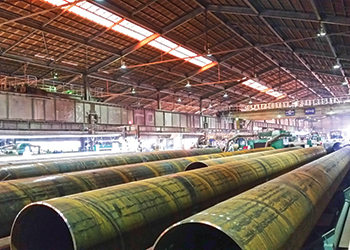 To meet the market demand for high pressure gas line pipes, NPC started to produce longitudinal seam SAW pipe by setting up the second pipe plant with rated production capacity of 180,000 metric tonnes. The plant started its commercial production in 2001 producing longitudinal pipes with outside diameters ranging from 24 to 60 inches (610-1524 mm) and 0.250 to 1.200 inches (6.4 - 30.5 mm) wall thickness with API 5L. Since the start of its production more than 30 years ago up to May, 2015, NPC’s total helical seam SAW pipe mill production reached 4,000,000 metric tonnes while longitudinal seam SAW pipe mill production reached 750,000 metric tonnes. NPC’s supply history shows that 74 per cent of carbon steel pipes supplied were for the oil and gas industry while 22 per cent were for water usage and the remaining for other purposes. "NPC identifies the product by suitable means with respect to monitoring and measurement throughout the product realisation. Where traceability is a requirement, NPC controls the unique identification of the product and maintains the records," he explains. The company aims to achieve excellence and perfection in manufacturing quality pipes and related products: through professional management and teamwork; by committing its resources to the continuing development and improvement of technology; by maintaining a safe and conducive work environment; by recognising the dignity of work and rewarding outstanding performance of employees; while dedicating its efforts to the interest of customers whom it serves," the spokesperson says while elaborating on the company’s mission. NPC lays emphasis not only on meeting international standards and customer’s specifications but also ensures that pipe delivery schedules are met promptly. Moreover, NPC ensures that the supplied materials are suitable for wide range of welding parameters. "These parameters are taken care of over and beyond the requirements for strength, elongation, hardness, toughness, bendability and dimensional accuracy. The company goes out of its way to be more flexible in the utmost service and convenience of its customers by keeping a stock of various coils and plates for the popular pipe sizes to cater to small orders required immediately at a very short notice," he says. "Throughout the years, NPC manufactures and supplies pipes with appropriate quality, meeting the specified requirements and also the statutory and regulatory requirement to ensure customer satisfaction. NPC is recognised for production excellence," he adds. NPC has modern in-house facilities for its employees to care for their physical and mental well-being.